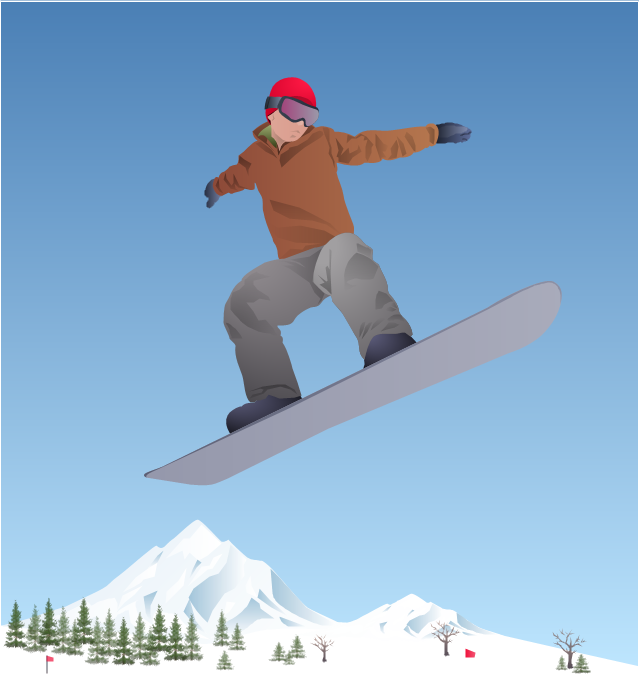 The vector illustration "Winter Olympics - Snowboard" was created using the ConceptDraw PRO diagramming and vector drawing software extended with the Winter Sports solution. The Winter Sports solution from the Sport area of ConceptDraw Solution Park contains the Sochi 2014 Winter Olimpics sports vector pictograms and clipart libraries and examples of diagrams, illustrations and infographics. "The curling competition of the 2014 Winter Olympics will be held at the Ice Cube Curling Center, nicknamed "the Ice Cube." It is the sixth time that curling will be on the Olympic program. In both the men's and women's competitions, ten nations will compete. These two events are scheduled for February 10–21, 2014. 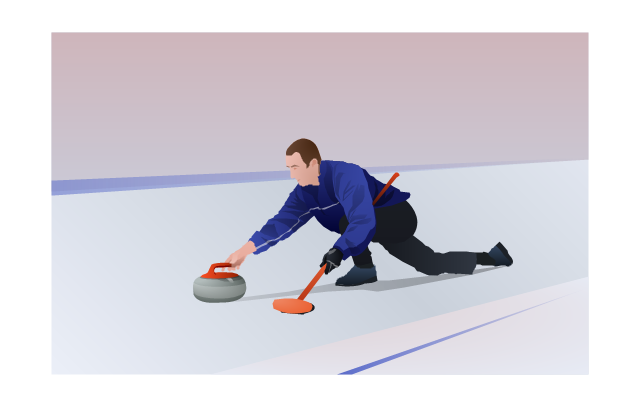 Qualification to the curling tournaments at the Winter Olympics will be determined through two methods. Nations may qualify teams by earning qualification points from performances at the 2012 and 2013 World Curling Championships. Nations may also qualify teams through an Olympic qualification event to be held in the fall of 2013. Seven nations will qualify teams via World Championship qualification points, while two nations will qualify through the qualification event. As host nation, Russia will qualify teams automatically, thus making a total of ten teams per gender in the curling tournaments. "Luge at the 2014 Winter Olympics will be held at the Sliding Center Sanki near Krasnaya Polyana, Russia. The four events are scheduled for February 8–13, 2014. In April 2011 the International Olympic Committee approved the addition of the mixed team relay event (one sled from each of the other three events compete per country), meaning luge will have four events on the program for the first time. 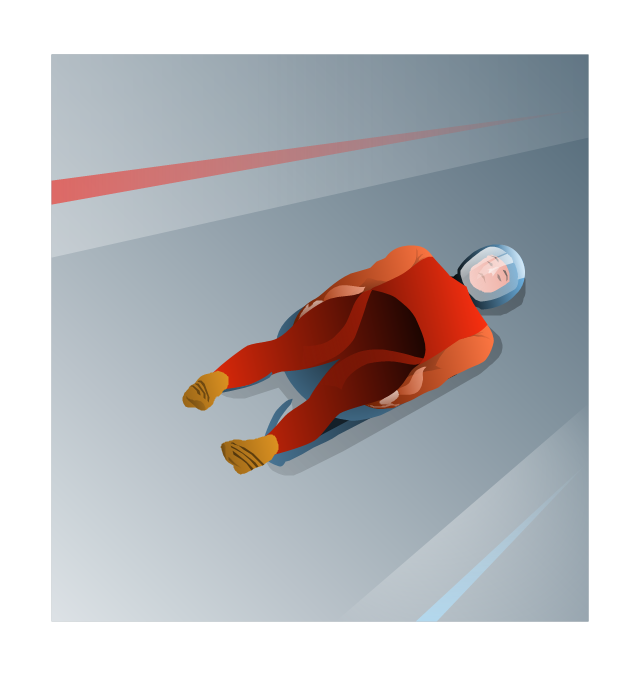 The vector illustration "Winter Olympics - Luge" was created using the ConceptDraw PRO diagramming and vector drawing software extended with the Winter Sports solution. The Winter Sports solution from the Sport area of ConceptDraw Solution Park contains the Sochi 2014 Winter Olimpics sports vector pictograms and clipart libraries and examples of diagrams, illustrations and infographics. 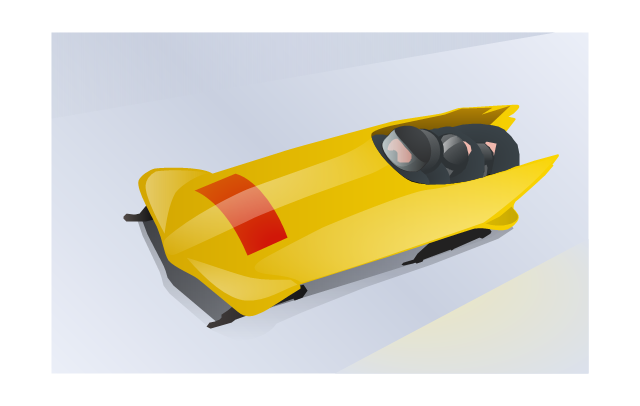 The vector illustration "Winter Olympics - Bobsleigh" was created using the ConceptDraw PRO diagramming and vector drawing software extended with the Winter Sports solution. The Winter Sports solution from the Sport area of ConceptDraw Solution Park contains the Sochi 2014 Winter Olimpics sports vector pictograms and clipart libraries and examples of diagrams, illustrations and infographics. 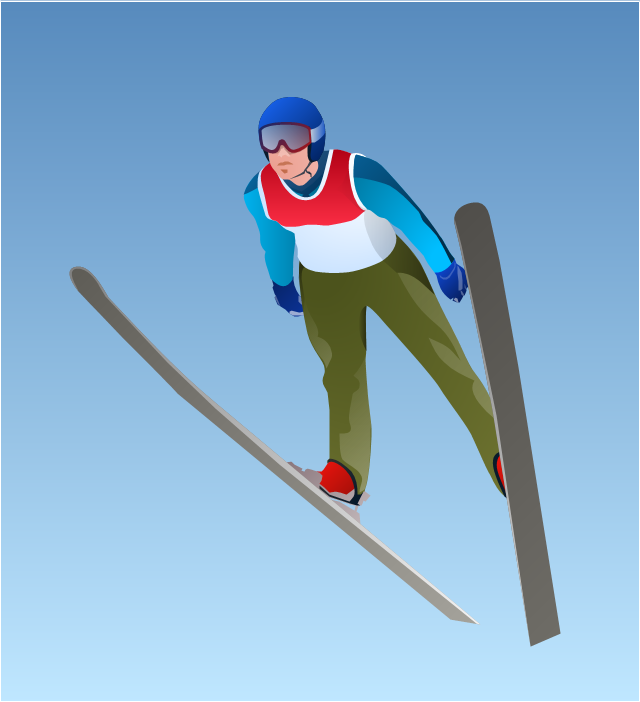 The vector illustration "Winter Olympics - Ski jumping" was created using the ConceptDraw PRO diagramming and vector drawing software extended with the Winter Sports solution. The Winter Sports solution from the Sport area of ConceptDraw Solution Park contains the Sochi 2014 Winter Olimpics sports vector pictograms and clipart libraries and examples of diagrams, illustrations and infographics. 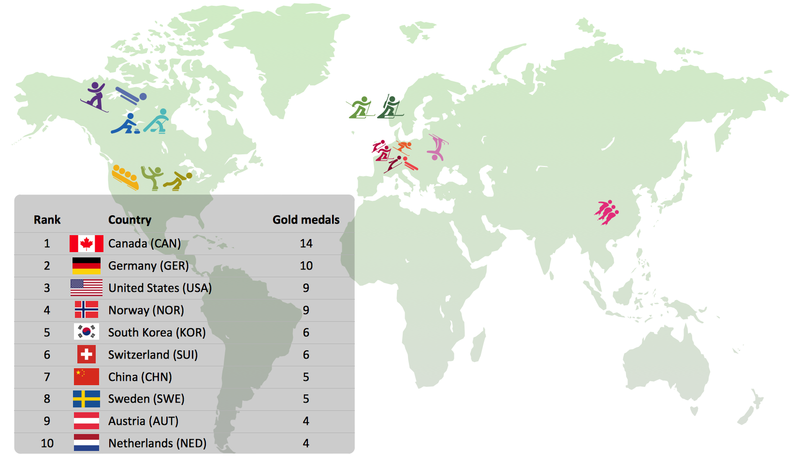 A total of 350 quota spots are available to athletes to compete at the games. A maximum of 22 athletes can be entered by a National Olympic Committee, with a maximum of 14 men or 14 women. There are two qualification standards for the games: an A standard and a B standard. 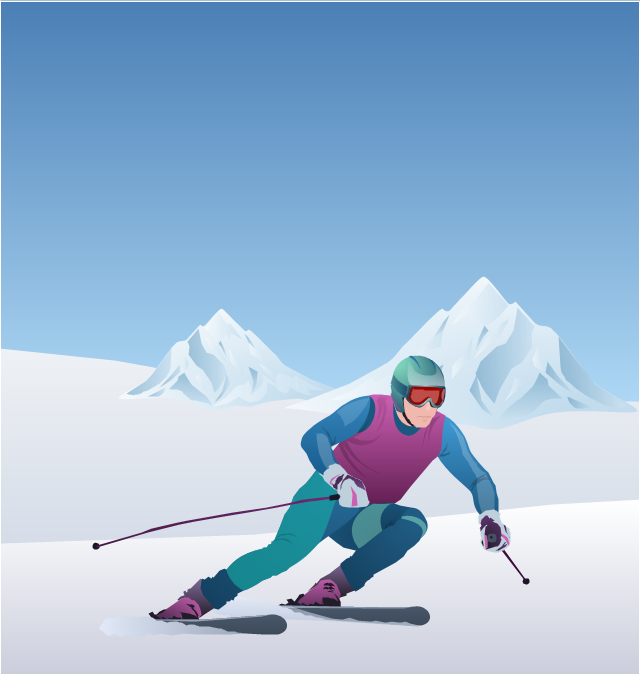 The vector illustration "Winter Olympics - Alpine skiing" was created using the ConceptDraw PRO diagramming and vector drawing software extended with the Winter Sports solution. The Winter Sports solution from the Sport area of ConceptDraw Solution Park contains the Sochi 2014 Winter Olimpics sports vector pictograms and clipart libraries and examples of diagrams, illustrations and infographics. 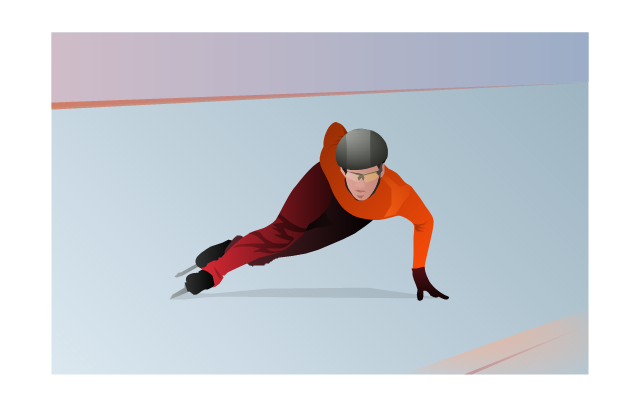 The vector illustration "Winter Olympics - Short track" was created using the ConceptDraw PRO diagramming and vector drawing software extended with the Winter Sports solution. The Winter Sports solution from the Sport area of ConceptDraw Solution Park contains the Sochi 2014 Winter Olimpics sports vector pictograms and clipart libraries and examples of diagrams, illustrations and infographics. 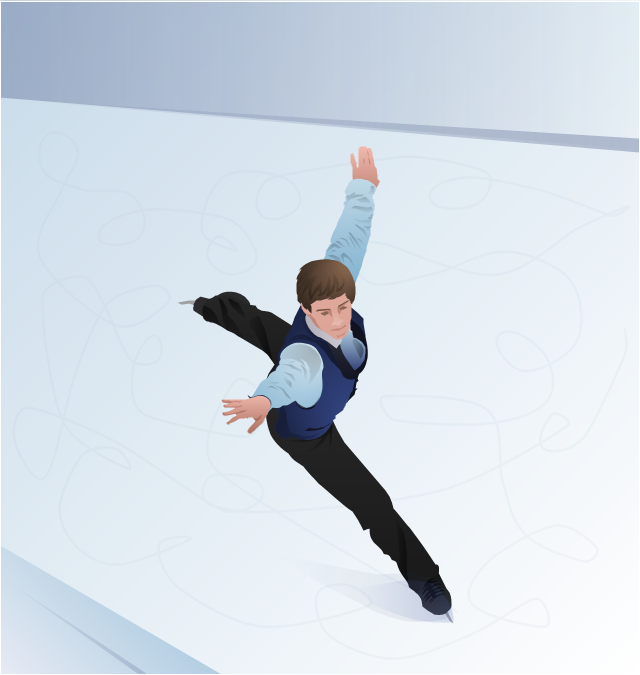 The vector illustration "Winter Olympics - Figure skating" was created using the ConceptDraw PRO diagramming and vector drawing software extended with the Winter Sports solution. The Winter Sports solution from the Sport area of ConceptDraw Solution Park contains the Sochi 2014 Winter Olimpics sports vector pictograms and clipart libraries and examples of diagrams, illustrations and infographics. 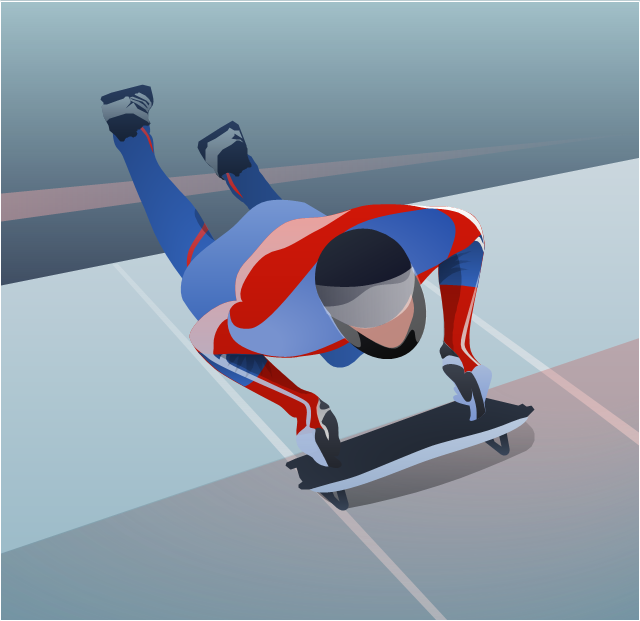 The vector illustration "Winter Olympics - Skeleton" was created using the ConceptDraw PRO diagramming and vector drawing software extended with the Winter Sports solution. The Winter Sports solution from the Sport area of ConceptDraw Solution Park contains the Sochi 2014 Winter Olimpics sports vector pictograms and clipart libraries and examples of diagrams, illustrations and infographics. 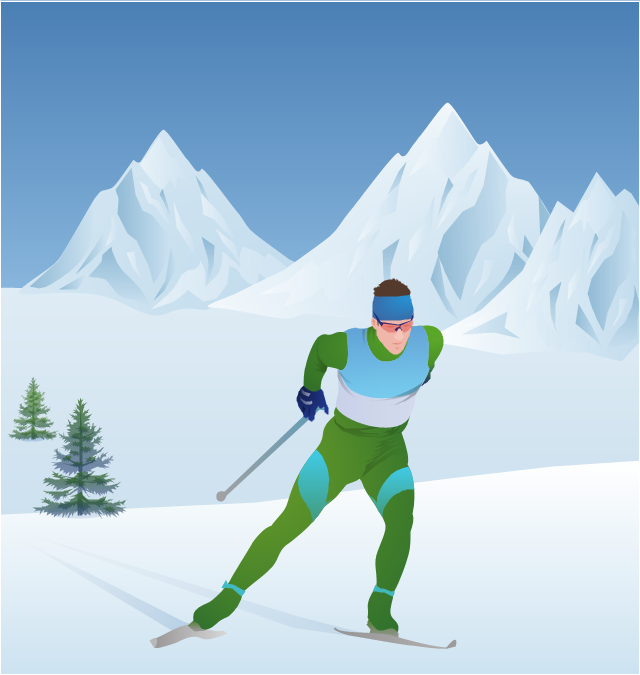 The vector illustration "Winter Olympics - Cross-country skiing" was created using the ConceptDraw PRO diagramming and vector drawing software extended with the Winter Sports solution. The Winter Sports solution from the Sport area of ConceptDraw Solution Park contains the Sochi 2014 Winter Olimpics sports vector pictograms and clipart libraries and examples of diagrams, illustrations and infographics. 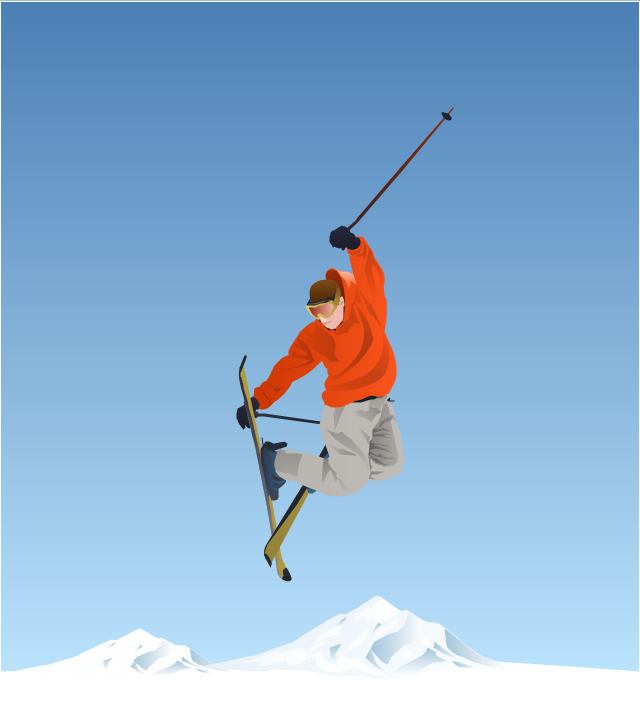 The vector illustration "Winter Olympics - Freestyle skiing" was created using the ConceptDraw PRO diagramming and vector drawing software extended with the Winter Sports solution. The Winter Sports solution from the Sport area of ConceptDraw Solution Park contains the Sochi 2014 Winter Olimpics sports vector pictograms and clipart libraries and examples of diagrams, illustrations and infographics. "Biathlon at the 2014 Winter Olympics will be held at the Laura Biathlon & Ski Complex near Krasnaya Polyana, Russia. 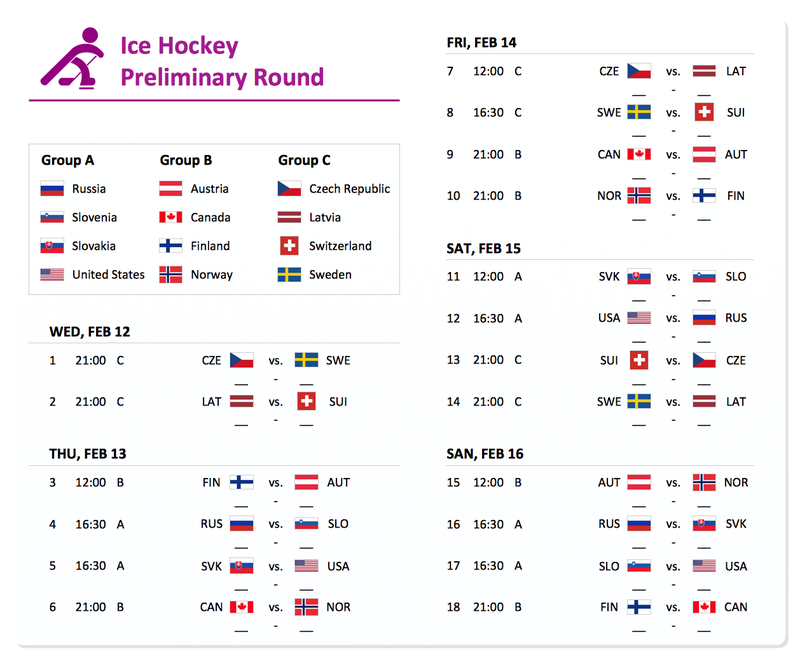 The eleven events are scheduled for February 8–22, 2014. The following is the competition schedule for all eleven events. Men's 4 x 7.5km relay. 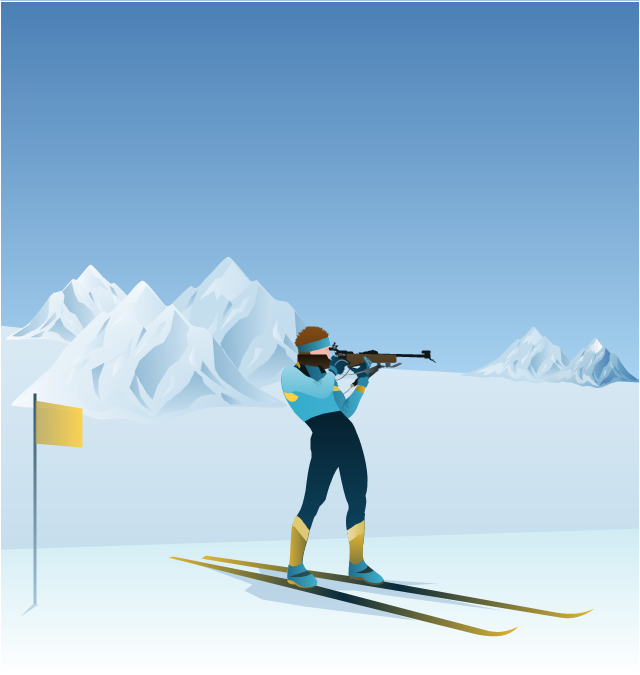 The vector illustration "Winter Olympics - Biathlon" was created using the ConceptDraw PRO diagramming and vector drawing software extended with the Winter Sports solution. The Winter Sports solution from the Sport area of ConceptDraw Solution Park contains the Sochi 2014 Winter Olimpics sports vector pictograms and clipart libraries and examples of diagrams, illustrations and infographics. 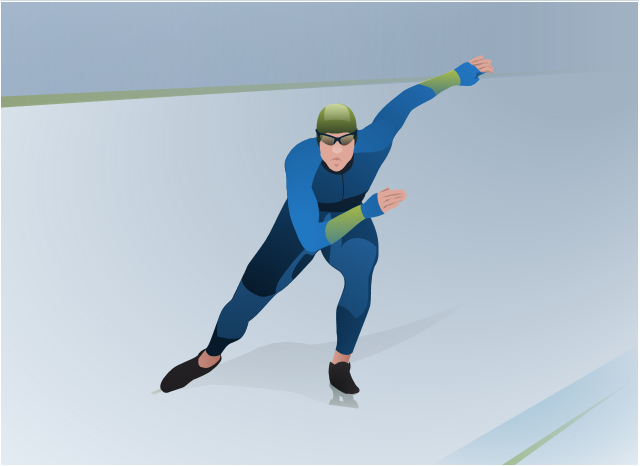 The vector illustration "Winter Olympics - Speed skating" was created using the ConceptDraw PRO diagramming and vector drawing software extended with the Winter Sports solution. The Winter Sports solution from the Sport area of ConceptDraw Solution Park contains the Sochi 2014 Winter Olimpics sports vector pictograms and clipart libraries and examples of diagrams, illustrations and infographics. 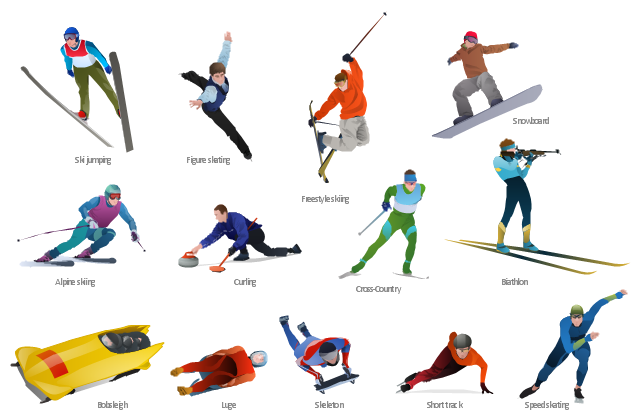 The vector clipart library "Winter Olympics" contains 14 sportsmen images: Alpine skier, Biathlon shooter, Bobsleigh, Cross-country skier, Curling, Figure skater, Freestyle skier, Ice hockey player, Luge, Short track skater, Skeleton, Ski jumper, Snowboarder, Speed skater. The design elements library "Winter sports pictograms" for the ConceptDraw PRO diagramming and vector drawing software is included in the Winter Sports solution from the Sport area of ConceptDraw Solution Park. This example shows the Coastal Cluster concept with all venues gathered around the Medals Plaza. The example "Sochi 2014 olympic coastal cluster map" was redesigned from the Wikipedia file: Sochi 2014 olympic coastal cluster map-en.svg. 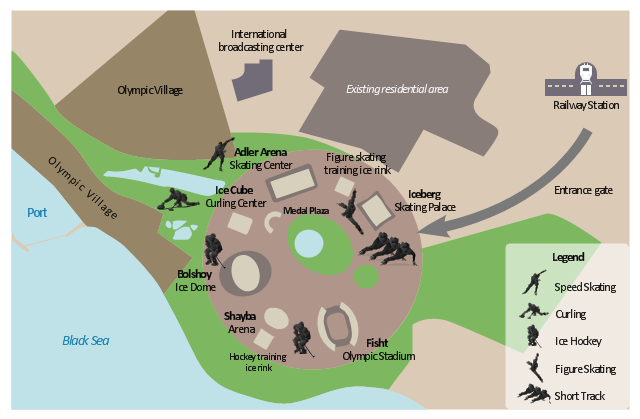 The example "Sochi 2014 olympic coastal cluster map" was created using the ConceptDraw PRO diagramming and vector drawing software extended with the Winter Sports solution. 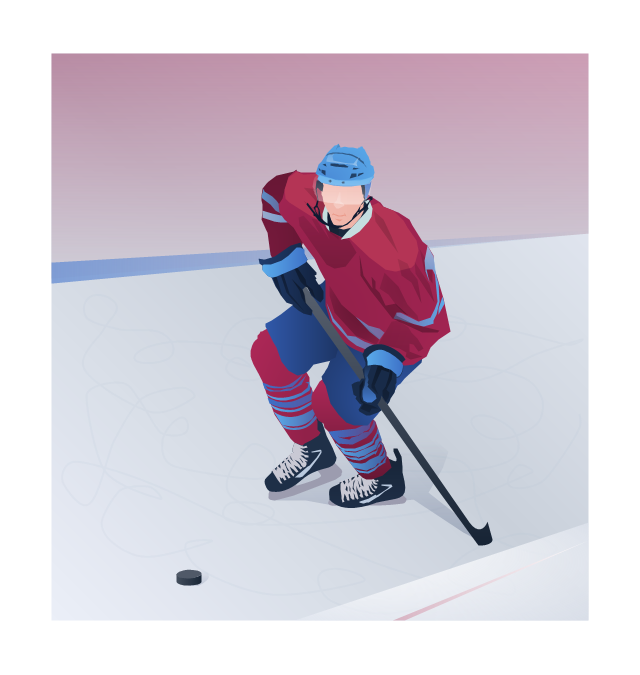 The Winter Sports solution from the Sport area of ConceptDraw Solution Park contains the vector stencils library "Winter sports pictograms" and examples of diagrams and infographics.